If you are looking for really big nets of carp, and I mean big, then head over to Kingsland Fishery. The big Carp Lake was on fire for those fishing the Conservative Club match there on Saturday. Bob Walker put a massive 353lb 6oz to the scales catching all his fish on dog biscuits from peg 22. That must be a fishery record and will be hard to beat from any water for the rest of the season. Leading the chasing pack with130lb 3oz was John Ruddy, followed by Ian Bradshaw on 128lb 3oz. 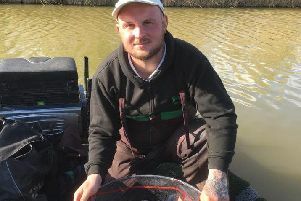 The latest Rookery Waters Saturday £1,000 qualifying open on the Jay Lake was won by Jimmy Brooks from peg 33 with 100lb 1oz. Runner-up was Richard Bond with 98lb 3oz from peg 47, then came Simon Godfrey with a level 98lb. In the Thursday £1,000 qualifying open on the Magpie Pool it was local rod Graham Welton from peg five who took the honours with 98lb 1oz. Runner-up was Simon East with 79lb 5oz and third Rob Goodson with 58lb 12oz. The Saturday Open on the Tow Island Pool at Float Fish Farm Fishery was won by Barry Young with a fine 123lb 2oz from peg 31. Close behind with 122lb 5oz was Simon Dow, followed by Roy Wells on 121lb. In the midweek Over 50s match on Two Island it was David Schwinger out in front with 136lb 11oz followed by Rick Tweddle (132lb 14oz) and Danny Carter (118lb 14oz). Webbs AC were at Buttonhole Fishery on Sunday and out in front with 138lb 11oz was John Crouch, who caught carp all day on meat and pellet. Runner-up on 104lb was Alan Forrest, then came Mick Humphries on 88lb 9oz.